Five hundred youngsters are now our voice to the world via a dedicated website. The project, featuring about 500 students from Israel Sci-Tech Schools Network to tell youth around the world about the experiences of youth in Israel. In recent years, students in the project to hundreds of thousands of views on their Facebook page. 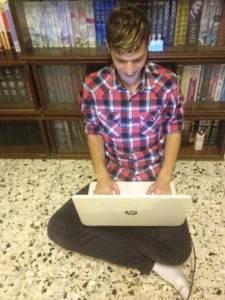 Jewish and Druze students act as pro-Israel ambassadors on the web. They surf the net to find and counter inflammatory content by challenging misinformation, presenting an Israeli perspective, promoting the existence of the State of Israel and defending against the hatred of the Jewish people. The project, initiated by the Network in cooperation with the Israel Foreign Ministry, places Israeli students from a wide range of cultures and backgrounds on the virtual frontline of Israeli advocacy. Meet some of our dedicated Eye2Israel students over recent years. The first day of Israel’s Operation Protective Edge sparked hundreds of Israel Sci-Tech’s Eye2Israel teenage reporters into action. They set up Situation Rooms and spend hours immersed in their laptops, cell phones and a 24/7 information hotline. Initiated by Israel Sci-Tech schools in cooperation with Israel’s Ministry of Foreign Affairs, Eye-2-Israel now has 300 active young reporters. One third of them live in southern Israel, the region battling the greatest upheaval. This time, missiles are flying much further afield and for our students, along with the rest of Israel, the summer break is not ‘holiday as usual’.During the Gulf War, a mere 18 months ago, we reported that 21 of our 206 Israel Sci-Tech schools were within range of the rockets and mortar shells volleying from Gaza. In the heat of our long summer holiday, our Eye2Israel reporters are completely dedicated to their mission, giving the world a unique personal perspective of teenage life amidst the war. They remain apolitical, presenting a sober, authentic point of view and representing us with dignity to the world. “I was in Tel Aviv and heard an alarm. I felt I had to share it with people. 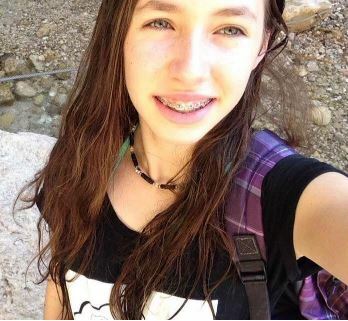 At other times, my messages are calmer and I like to show how we are living,”says student reporter, Mor from Yad Levovich Sci-Tech School, Netanya. Long beach days and watermelon are far from their minds. “NO to hatred and animosity! This is the Eye2Israel ethos. Eye2Israel is part of Israel Sci-Tech’s innovative work to foster a civil society based on respect for humanity, love of country and high-tech capability in Israel. Eye2Israel was established in cooperation with the Ministry of Foreign Affairs in 2007, providing a platform for students to engage in public diplomacy and hasbara (“explaining”, public diplomacy) to the world, established in 2007. 300 young reporters country-wide, selected and trained including regular briefings by the Ministry of Foreign Affairs. Subject matter ranges from sports, culture, technology, and now war. 85,000 web-visitors from 85 countries, from Yemen, Egypt, Lebanon, even from a US aircraft carrier on the Pacific Ocean. We thank all our friends and supporters for their concern and care for our students. We are Tasneem and Larisa. We are two students in Israel. We live in the same city and are in the same age range. 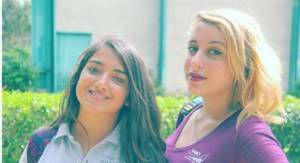 We study in different schools, but we both attend a program that is being held in Israel Sci-Tech schools all around the country, called “Eye2Israel”. It’s a program where teens talk about our country from the point of view that only teenagers can provide. Tasneem studies in an Arabic school, majors in Physics and Chemistry and she’s 16 years old. Larisa studies in a Jewish school, majors in Communication and Theater and she’s 15 years old. There’s a message we want to spread. The message of co- existence. We live in a mixed city, part Arab, part Jewish and we are full of colors and diversity. We have festivals celebrating the holidays of both religions , we have school meetings between Arab and Jewish schools, like all people we have our differences but we both agree. So, we are Tasneem and Larisa. And we believe in Peace, and we hope we made a part of you believe in it as well.